The four cities are present with actors that wear colourful and precious costumes reproduced by ancient models, flags, trumpets and drums. Every group has the assignment to remember and to re-enact episodes and characters of the maritime history of its own city, and therefore of the whole Country and its role in the Mediterranean sea. A sea that unites the contenders and has a double meaning: once scenery of sour battles, but also net of communications and exchanges built by navigators, merchants, artists and scientists of the four Maritime Republics, it represents the most extraordinary example of interaction between different people and nations. 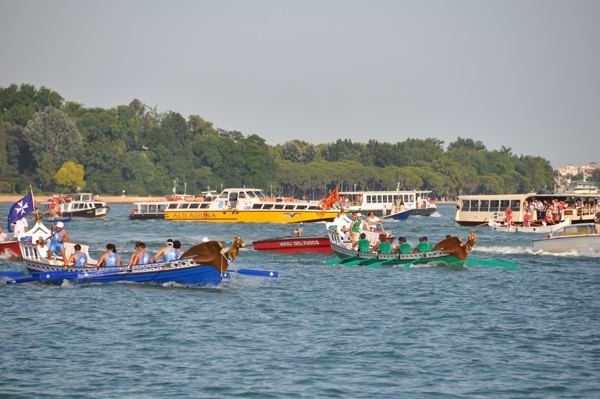 The sporting competition lies in the challenge between the rowing crews of the 4 cities, each one composed by 8 rowers and a helmsman, on board of fiberglass boats defined by different colors and by splendid figureheads: the winged horse of Amalfi, the dragon of Genoa that reminds the protector of the city St. George, the eagle of Pisa symbol of the ancient bond between the Republic and the Romano Empire, and the winged lion of Venice, that reminds St. Mark Evangelista, patron of the city. 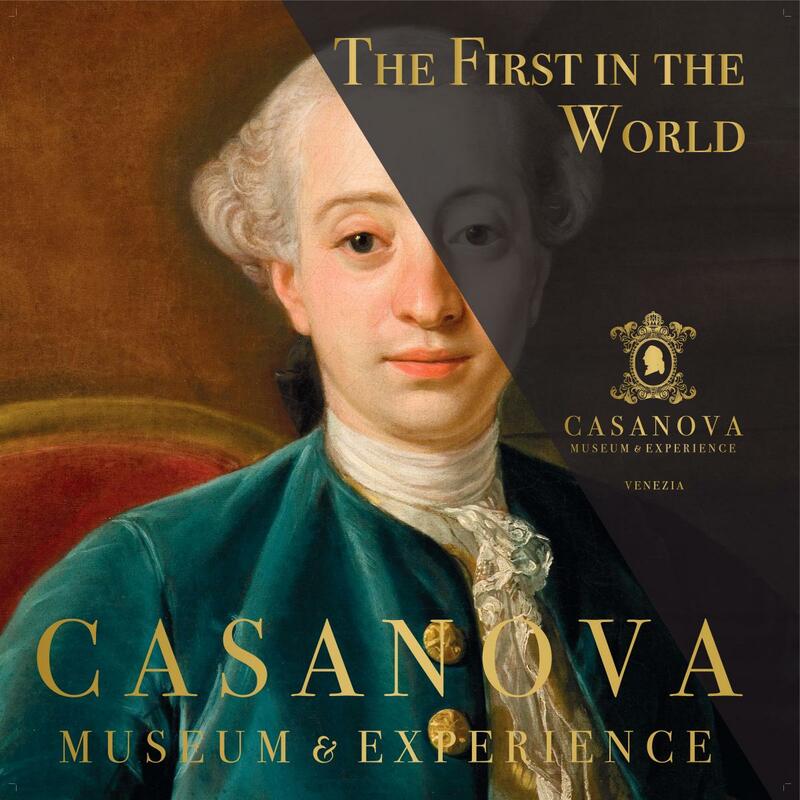 The first figurehead passing the finishing line, at the end of the course, wins a golden and silver trophy realized by the Scuola Orafa Fiorentina representing a galleon supported by 4 hippocampus and the coats of arms of the Four Republics. The trophy remains in the hands of the winning city for one year, being then put as the prize of the following Regatta. 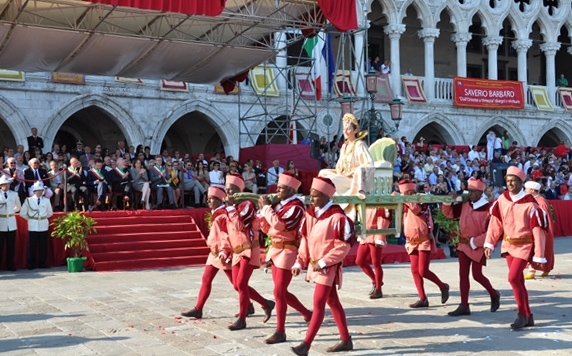 5.00 pm Historic pageant: the pageant will open with the four costumed delegations of Pisa, Amalfi, Genoa, Venice. 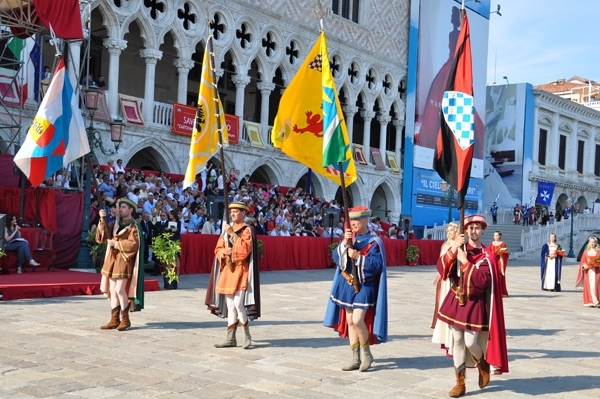 The solemn parade will proceed along Riva degli Schiavoni, St. Mark’s Square, the Piazzetta and St. Mark’s Pier. 6.15 pm Start of the Galleons Regatta: The starting line will be in front of St. Elena’s Gardens. The boats will cover a distance of 2 thousand metres through the St. Mark’s Basin. Finishing line at St. Mark’s Pier. Children under 6 accompanied by an adult free, no seat assignment.